Kaza a small but beautiful town in Spiti Valley Himachal Pradesh. Kaza is 210 Km from Kalpa, 47 km from Tabo. It is situated at the left bank of river Spiti at an altitude of 3800 Meters. 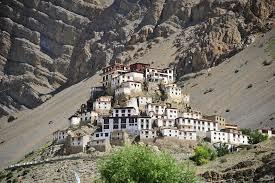 Kaza the beautiful town of Spiti Himachal is famous for its colourful festivals and Sakya Tangyud monastery. Kaza is a cold desert with very close similarities to the Tibet and Ladakh regions in terms of terrain, climate and the culture as they follow Buddhist culture . Kaza is perfect place for tourists because of its precious beauty, perfect scenery and peaceful nature. It's perfect place for various tourist activities. Weather in Kaza is pleasant in summer but colder than other region of country. Winter lies between November to April in this region , and temperature during winter is below freezing point due to heavy snowfall. 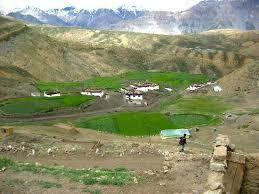 Kaza in Spiti valley and its nearby village has good accommodation and other facilities like Petrol/Diesel pumps. It also has a market for daily necessities. There is also good facilities of medical services. Dhankar: This beautiful place is located at a height of 3890 m , 24 km from Tabo and famous for Buddhist monastery. Pin Valley : A valley which is very beautiful and known for its monasteries, is below kungri glacier. Kunzum pass: Kunzum pass is at a height of 4551 m and 74 km from Kaza. Kunzum pass is highest motorable pass. Kunzum pass is named on the name of Goddess Kunjum. Chandar tal lake: Chandar Tal lake is located at a height of 4270m and around 7 km from Kunzum pass and 81km from Kaza. This lake is one of the most beautiful lake in Himalayan region,this lake is Surrounded by snow, this deep blue water lake has a circumferences of 2.5 km. River Chandra flows very close to the lake. Tourist can get limited food variety here in Kaza. Only Indian and Tibetan food is available here ,in vegetarian and non vegetarian variety. Best time to visit Kaza is between may to September due to better temperature. 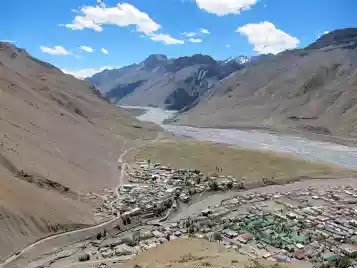 Kaza is central station to the other parts of the Spiti valley, Kaza is perfect place for base camp for trekking, mountaineering and tours directed to other parts of the valley. Best place to stay in Kaza , Spiti valley are of different range, mid range and low range also available near river. PWD guest house is also available in Kaza but prior booking is needed. Home stays in Kaza is also available and it's best if tourist want to explore culture of region. To visit this region foreigners have to take permit from SDM or DC office , this is not applied on Indian tourist. Nearest airports : Kullu (Bhuntar) 250 km. and Shimla 445 km. Kaza can be approached by road from Shimla in month of May to October and from Manali 200 km. via Kuzam Pass in month June to October.